Rachel Levy took the 1 Mile victory in a wire to wire solo effort. 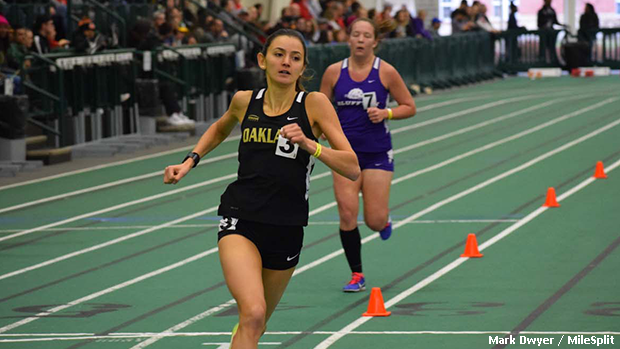 Oakland's track and field athletes appeared to be in mid-season form during their opener this past weekend at Tiffin University. Rachel Levy went 5:04.99 to earn an emphatic win in the 1 Mile contest. Her time was 25 seconds clear of runner-up, Jessica Price of Shawnee State. Levy, who owns a pr of 4:58.50, was in complete control from the opening gun. Elsewhere, Zach Stadnika claimed third in the 60m hurdles finals due to his 8.21 clocking. Stadnika's time represents a new school record. Big congrats to @zstadnika97 who took down the school record in the 60 hurdles in the first meet out of the gate!! Zach ran 8.21 and broke a record that has stood since 2011. Exciting start to the indoor season for our whole team at Tiffin yesterday!! Great job Golden Grizzlies!